At least 13 former Durham Bulls are on the rosters of this year's playoff teams. Two of them are on the 60-day disabled list, so unlikely that we will see them in action. It's a bit of a commentary on the Rays that three of them (Gimenez, Navarro, and Lobaton) are catchers. Congrats to them all. Good luck to them all. We missed two former Bulls, but thanks to the Hit Bull Win Blog, we stand corrected. Mike Montgomery, now with the Cubs, was a Bull back in 2013 and 2014. Adam Liberatore, now with the LA Dodgers, was a Bull in 2012 thru 2014. He won't be pitching this post-season since he's out for elbow surgery. Lots of interesting trivia at HBWB. What Happened to the Rays on June 16th? June 16th was the beginning of a long, long, long slide for the Tampa Bay Rays. The Seattle Mariners were playing the Rays inside the Bandbox-By-The-Sea Bay. The day before (the 15th) the Rays had won a 13 inning affair when the Mariners pitcher gave up a triple to Logan Forsyth, hit Tim Beckham, walked Taylor Motter, and walked Logan Forsyth for the winning run. Matt Andriese, who had been sent to the bullpen after winning five games as a starter, got the win in relief. The game lasted 4½ hours. Box. Wrap. That was to be the last game that the Rays had even a sniff at competing in the American League East. Although no one noticed, the next day was the beginning of the end. June 16th was a Thursday and the last of the three-game set against the Mariners. It was a day game starting at 1 o'clock after Wednesday's long game. The Trop had 11,331 fans in paid attendance. Blake Snell was having his debut appearance at Tropicana Field. He'd had a spot start back on April 23, but with this start he was going into the rotation to stay for the rest of the season. Snell's first inning didn't go well when the Mariners scored three runs, two of them on a Tim Beckham error. Nor did his 4th inning when the bases were loaded, partially due to yet another Tim Beckham error. Snell left the game with the bases loaded and Ryan Garton gave up a two-run double. Snell took the loss, but was only charged with one earned run of the five scored on his watch. 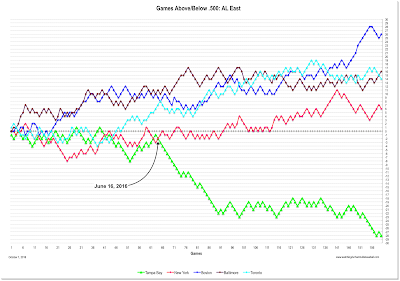 Meanwhile, the lineup for that day included four players hitting below .200 and a couple just barely over that line. Nevertheless, they did put together 12 hits and 4 runs. They were just one run back until Tyler Sturdevant gave up a home run in the 9th. "We found some ways to win this series; obviously we didn't today," manager Kevin Cash said. "I think there's still enough to be a lot positive about. We continue to battle, put guys in scoring position. The big hit kind of eluded us. Loved the way our bullpen, Garty and Sturdy (that's Ryan Garton and Tyler Sturdevant in nonbaseball nomenclature) kept us in the ballgame and gave us plenty of opportunity. The at-bats were tremendous. We just couldn't quite find that one separating hit. Really, really liked the way the guys competed. "These," [Steven Souza Jr.] said, "are really important games." The excitement that came with Blake Snell's arrival to Tampa Bay was erased quickly due in part to both his lack of command and the poor defense around around him. 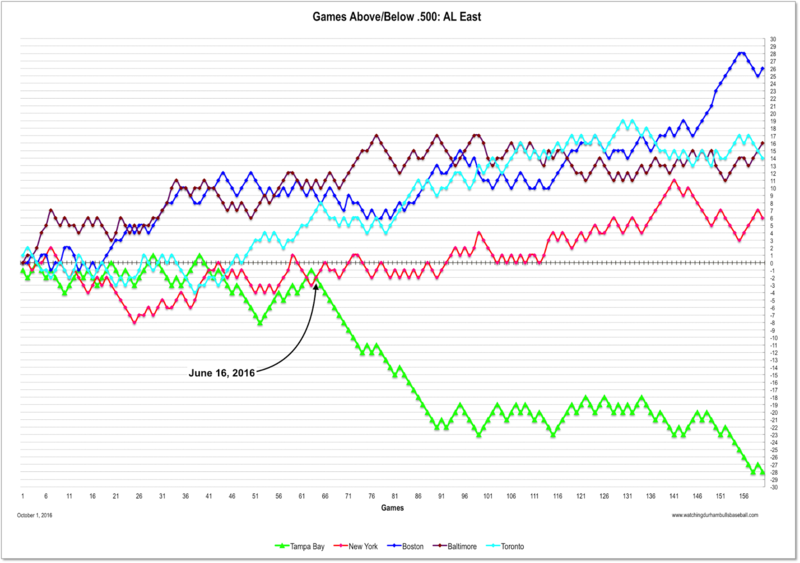 Nevertheless, who would have thought that June 16th was the beginning of an 11-game losing streak and a subsequent slide that continues to this very day?